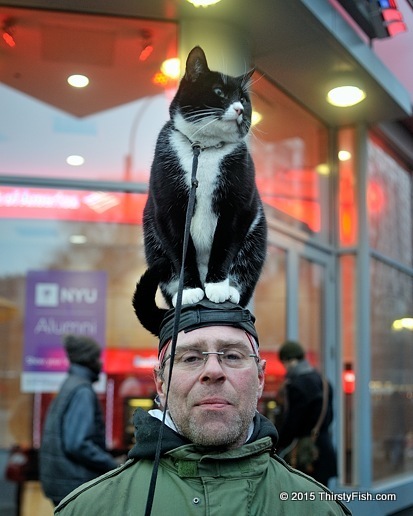 People of New York City; A cat and a man. I guess you can call this a "Declaration of Guilt". When the generations of the future ask us, why our generation didn't stop injustice when it could still be stopped, why we didn't preserve the environment, why we didn't halt the greed which is destroying the world, why we let corporations exploit and plunder with impunity, why we didn't hold governments to account, why we allowed a bunch of madmen drag us into meaningless wars, and why they don't have fresh air to breathe, clean water to drink and food to feed them, our answers are going to sound lame: We were too busy entertaining ourselves, trying to prove the superiority of our religions, writing meaningless books, playing with our gadgets, building robots to "qualify" our lives, fooling ourselves that we were doing scientific research while actually engaging in scientism. And in my case, just walking around taking photos and writing meaningless things. I am guilty as charged. I am sorry.